Title text: "It's going to be weird near the end of May when the screen goes blank for over 18 hours." Actually, it's more like the reverse of OTTer life: we could have watched in real time, or Waited For It and binge-watched at 2300x faster via any of the collector sites that popped up. I WAITED A HALF HOUR FOR ONE DARKENING PIXEL. Years ago, I was in San Jose on the day of the Super Bowl, and went on a hike in the hills with two dozen geeks. Our leader, Brad T., had jury-rigged a digital video recorder (before there were commercial products that did this) and was capturing the whole show on hard disk. But we weren't interested in the football, just the special effects used in the commercials. After we returned from the hike, Brad searched the stream and played only the commercials (and we lingered only on the technically interesting ones). That was about a 10 to 1 compression (including replays and freezeframes and hypothesizing about technique), so Brad's "superbowl compression party" lasted about 5 hours, most of it hiking and enjoying nature, while we talked about the software and hardware startups that some of the hikers were building the other 160 hours of the week. keithl wrote: Years ago, I was in San Jose on the day of the Super Bowl, and went on a hike in the hills with two dozen geeks. Our leader, Brad T., had jury-rigged a digital video recorder (before there were commercial products that did this) and was capturing the whole show on hard disk. So.... you knew the way to San Jose? Bloopy wrote: If you screen it in black and white, it elicits rave reviews from Béla Tarr fans. I honestly didn't expect Tarr Béla to pop up in a discussion about an xkcd comic. OK, the title text seems to imply there was 28 seconds (18 hours / 2300) of dead air somewhere around the middle of the broadcast. I was watching but didn't notice anything like that. Did I miss something during a halftime restroom break? Maybe they blanked out Timberlake? Heimhenge wrote: OK, the title text seems to imply there was 28 seconds (18 hours / 2300) of dead air somewhere around the middle of the broadcast. I was watching but didn't notice anything like that. Did I miss something during a halftime restroom break? Maybe they blanked out Timberlake? Yes, there was about 30 seconds of black screen here in NYC. I don't remember exactly when during the game, but we thought it was a missed cue for a commercial or something. I hadn't seen anything else about it on-line, so I'm glad to know somebody else saw it. I saw the blackout too. I heard about it, but I wasn't made aware of the cause, so I thought maybe someone had deliberately made a commercial that consisted almost entirely of dead air. Turns out NBC just failed to cue the commercial break in time. No specific commercial had to be cut to make up for the lost time. Actually, that's a good point—the Super Bowl is a football game, and as such could easily run past the allotted time slot. 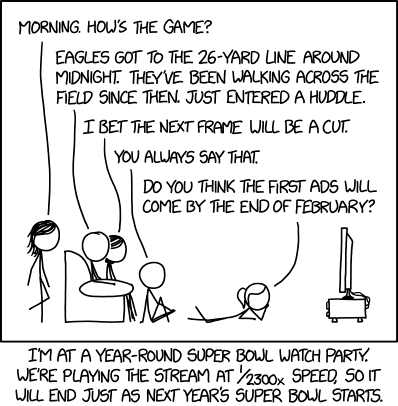 I believe the custom during sporting events that run long is to continue going to commercial at the usual intervals, so what happens when it's the Super Bowl and they've charged millions per minute for a finite number of slots that they've now used up? Eshru wrote: I'm sure there is a list of hey we'll pay you x if there is time to air this ads. More than likely, there's a waiting list for which, if time permits, the advertiser gets the privilege of paying the full $5M for 30 seconds of air time. Knowing the NFL's propensity for extracting as much cash from that event as possible, it's unlikely they'd be willing to haggle over the cost. And if extra ads are needed, they pretty much have to be in overtime ... so there's a good case the League would want more for that time slot. But I'm just making an educated guess based on the League's greed. If anyone knows for sure, I'd love to hear. My guess is that there's also a token fee (not more than $500K) for being added to the "if it goes long" list, with the balance of the standard charge being levied if the advert is actually aired. Re: 1951: "Superb Owl Watch Party"
I've never watched any of a superb owl. But if someone put up a 1/2300 speed stream (or Time-like technology) I might be tempted. Oh. This was linked from the Time thread. Not sure why it wasn't linked here. Eternal Density wrote: Oh. This was linked from the Time thread. Not sure why it wasn't linked here. It just was - they just had to wait for it. What do you mean? It hasn't been linked ye... oh, well played. So, apparently Pink clocked in at 113 seconds for the National Anthem, so multiply by 30 fps and 85 and a half seconds per frame, means you'll be standing for 80 and a half hours to be properly patriotic. When I first saw the title, I thought that wristwatches would be involved. I was completely wrong, but it's funny to me that the comic still landed on the topic of time. You'd think at that frame rate, they wouldn't need such lossy compression.